One of the best ways of spending your time is by fishing. When you look at the statistics, you will notice that the numbers of people who are engaging in this activity have been growing. Specifically, Kayak fishing is among the most popular fishing methods that we have today. The only problem is that many people have been kayaking the wrong way. It is estimated that one in every five people who use this method does it right. If you want to be at the top of your game and get the biggest catch, make sure you follow these advanced kayak fishing tips. Even though it is great to have the right experience, it is critical that you bring the best fishing equipment with you. Many people tend to ignore basic fishing tools, but they play a huge role in your success. Most of the kayaks usually come with the necessary tools that you need, but it is important to make sure that you make some additions. Deck Sheath is one of the equipment that you need. There have been cases where people have been stubbed by their bait knives since they didn’t have the deck sheath. The folding anchor is another tool that I use every time I am fishing. The purpose of this tool is to anchor your kayak on flat waters. Its benefits include freeing your hands when you find a hot spot so that you can chum and catch the live bait. There are many fishing gear and accessories that you may need to have. It is very common for people to struggle with their balance when sitting on a kayak. Even the most experienced kayak fishers have admitted that acquiring appropriate balance when sitting on a narrow kayak remains to be a challenge. The simplest way of handling this issue is by straddling. I always drop my legs in the water to get my balance. This technique has worked for me as well as other experienced kayak users. When you straddle, you will be able to lower your center of gravity and get the balance that you need. This technique is efficient especially when you are struggling with a white seabass which are known to be wild. I have to admit that this may not be easy for anglers that have been fishing from the bank. Since the kayak doesn’t give you much room to use both hands, it is important that you learn to cast with one hand. If you are going to use this technique, you need to have the right gear with you. The best tools that you can use could be the Spinning Tackle or the Baitcasting which have proven to work for me all the time. I would recommend that you train how to cast with one hand in a safe environment before you go fishing. This will give you enough time to practice and perfect this technique. You can use the baits such as the spinnerbaits to help you steer the boat since these baits are known to offer resistance. If you have a light-weight kayak and you are fishing a crankbait, you may try to use this to your advantage. The reeling of the bait that is caused by the resistance will pull your boat towards the direction that you have cast your bait. Make sure that you cast your bait towards the direction that you wish your boat to go. This technique will save you time and energy that you will use to paddle your canoe. It is true that many anglers avoid currents when they are fishing on a kayak. What they fail to notice is that you can actually use this to your benefit. The advantage is on the weight of the kayak which is light. This gives it the ability to sitting in an Eddie without moving downstream. You get more than enough time to fish the current for as long as you may wish. I would advise you to go behind the Eddie, which will give you access to all the fish that you may want without even paddling. This is a little trick that I picked a few years ago almost by accident, but I was glad that it worked. You may experience a bit of difficulty at the beginning, but if you keep practicing, it will become a habit. It is straightforward to paddle your kayak with both your hands since you can get the rhythm well. However, I would encourage you to try using one hand. There are many benefits of perfecting this tip since you may find yourself struggling with a stubborn catch while trying to stabilize and steer your kayak. The trick that works for me is by locking the shaft of the paddle on my forearm. I found out that when I do this, it gives me the ability to use it as a canoe paddle. I would suggest that you practice this on still waters before you decide to put it into action. If you must fish when the waters are rough or when it is raining, I would highly recommend you fish on the shallow waters. I found it easy to navigate my kayak during the windy conditions when I fish along the shorelines. Make sure you don’t paddle towards the middle of the lake but take advantage of the shoreline. 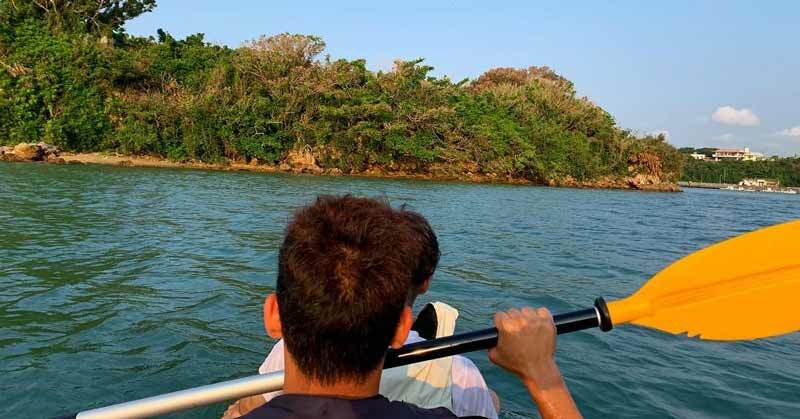 The shoreline vegetation is known to mitigate the wind and the waves that may make it impossible for you to paddle your kayak towards your desired spot. Knowing the right equipment for your fishing is one of the most important things. You can teach yourself how to straddle, cast with one hand, and paddle with one hand on shallow and still waters. You should bring experienced people with you when you are planning to fish behind a current. Kayak fishing is one of the most amazing experiences. I hope these tips will give you a competitive edge and help to make your fishing trip worth it. The experience that you will get by putting these kayak fishing tips into action will make you a seasoned kayak angler in a short time.